Sir Roger Penrose, was born in England, in Colchester, August 8, 1931. His parents were both highly educated. His mother Margaret Feathe was a doctor, and his father, Lionel Sharples Penrose, was a medical geneticist who was elected a Fellow of the Royal Society. He and his brothers Oliver and Jonathan all went into the sciences. Jonathan became a psychologist, while Oliver, the eldest, became a mathematician. In 1939 Roger's father went to the United States with his family but as all the indications pointed towards the outbreak of war, he decided not to return to England with his family but accepted an appointment in a hospital in London, Ontario, Canada. Roger attended school in London, Ontario but although it was during this period that he first became interested in mathematics it was not his schooling which stimulated this interest, rather it was his family. Roger's father became Director of Psychiatric Research at the Ontario Hospital in London Ontario, but he was very interested in mathematics, particularly geometry, while Roger's mother was also interested in geometry. In 1945, after the World War II ended, the Penrose family returned to England. Roger's father was appointed as Professor of Human Genetics at University College London and Roger attended University College School in London. Then his interest in mathematics began to increase but his family saw him following in his father's footsteps and taking up a medical career. However, as was typical in schools at this time, biology and mathematics were alternatives at the University College School with pupils having to choose one or the other. Penrose entered University College London which he was entitled to do without paying fees since his father was professor there. He was awarded a B.Sc. degree with First Class Honours in Mathematics and then decided to go to Cambridge to undertake research in pure mathematics. He was following in the footsteps of his older brother Oliver who had also taken his undergraduate degree at University College London and had gone to Cambridge to undertake research but Oliver had chosen physics. Roger, however, was set on research in mathematics and on entering St. John's College he began research in algebraic geometry. Penrose was awarded his Ph.D. for his work in algebra and geometry from the University of Cambridge in 1957 but by this time he had already become interested in physics. In 1964 Penrose was appointed as a Reader at Birkbeck College, London and two years later he was promoted to Professor of Applied Mathematics there. In 1973 he was appointed Rouse Ball Professor of Mathematics at the University of Oxford and he continued to hold this until he became Emeritus Rouse Ball Professor of Mathematics in 1998. In that year he was appointed Gresham Professor of Geometry at Gresham College, London. His research interests include many aspects of geometry, having made contributions to the theory of non-periodic tilings, to general relativity theory and to the foundations of quantum theory. While Penrose received his Ph.D. at Cambridge in algebraic geometry, he began to work on the problem of whether a set of shapes could be found which would tile a surface but without generating a repeating pattern (known as quasi-symmetry). Armed with only a notebook and pencil, Penrose set about developing sets of tiles that produce 'quasi-periodic' patterns; at first glance the pattern seems to repeat regularly, but on closer examination you find it is not quite so. Eventually he found a solution to the problem but it required many thousands of different shapes. After years of research and careful study, he successfully reduced the number to six and later down to an incredible two. It turned out this was a problem that couldn't be solved computationally. Penrose triangleAlso, in 1954 he and his father published article in British Journal of Psychology about basic impossible figures: impossible triangle and endless staircase. In the article impossible triangle (also known as tribar) was represented in its common view with perspective effect. These impossible figures were used in lithographs of holland artist M.C. Escher. Penrose believes thet the brain can execute processes that no possible Turing-type computer could carry out. He is famous for his books on consciousness such as "The Emporer's New Mind" (1989). He also considers physics incomplete because there is as yet no theory of quantum gravity. Penrose hopes that an adequate theory of quantum gravity might contribute to explain the nature and emergence of consciousness. In this sense, his main research program in physics is to develop the theory of twistors, which he originated over 30 years ago as an attempt to unite Einstein's general theory of relativity with quantum mechanics. 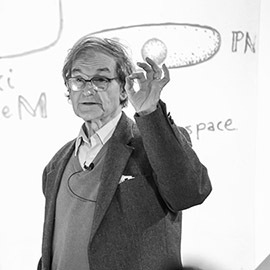 Sir Roger Penrose Penrose has received many honours for his contributions. He was elected a Fellow of the Royal Society of London (1972) and a Foreign Associate of the United States National Academy of Sciences (1998). The Science Book Prize (1990) which he received for The Emperor's New Mind but this is only one of many prizes. Others include the Adams Prize from Cambridge University; the Wolf Foundation Prize for Physics (jointly with Stephen Hawking for their understanding of the universe); the Dannie Heinemann Prize from the American Physical Society and the American Institute of Physics; the Royal Society Royal Medal; the Dirac Medal and Medal of the British Institute of Physics; the Eddington Medal of the Royal Astronomical Society; the Naylor Prize of the London Mathematical Society; and the Albert Einstein Prize and Medal of the Albert Einstein Society. In 1994 he was knighted for services to science. In 18th January 2006 Sir Roger Penrose, Emeritus Rouse Ball Professor of Mathematics, has received the 2006 Communications Award of the Joint Policy Board for Mathematics (JPBM) in the US. Presented annually, the award recognises outstanding achievement in communicating about mathematics to nonmathematicians.